Ms Elphick, who helps to continue education during kids� hospital stays, said music was an important component of a balanced school curriculum. �Research has shown that those who learn an instrument tend to have improved academic achievement, enhancing their test scores, attitudes, social skills, critical and creative thinking,� she said. 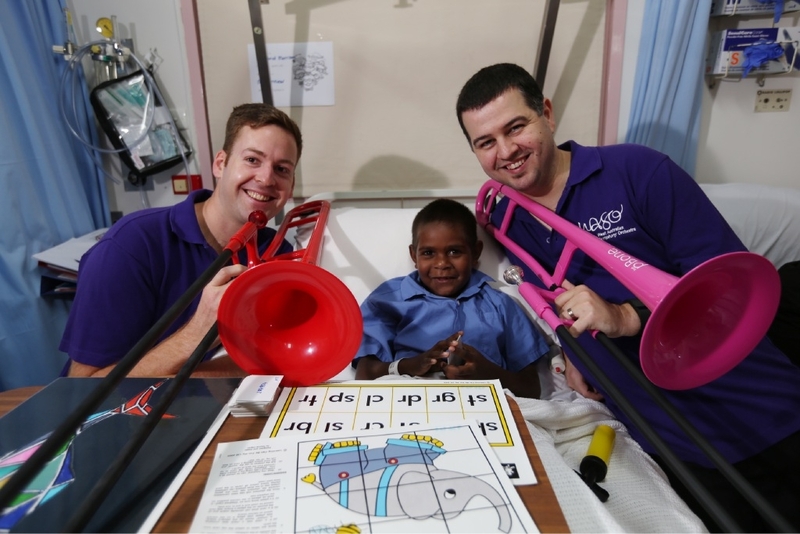 For seven years, WASO musicians have visited children in Princess Margaret Hospital (PMH) to play music on the wards, deliver interactive workshops and ensemble performances. �Sometimes the days are quite long and this gives a new opportunity; some of the older kids even have a go on the instruments,� Ms Elphick said. WASO trombonist Liam O�Malley said travelling around Perth to perform gave many children the chance to see orchestral instruments up close. �It�s a logistical nightmare to get a full orchestra around, so we usually take a small group of people,� Mr O�Malley said. WASO community engagement manager Cassandra Lake said the program was self-funded, with assistance from program partnerships. An ensemble of at least 12 WASO musicians and 16 WASO Chorus singers will perform a mix of traditional and contemporary Christmas Carols at the Telethon Theatre on December 8.